One of 65 hand lettered photographs from my 2018 expanded essay Nature as a Metaphor for Economic, Emotional and Existential Horror. This piece appeared in the second and third iterations of this project at Capsule NYC and School 33 Baltimore 2018. Trailer for In The Jungle, 2017 feature film. A piece of expanded poetics which combines written and spoken text with music composed with the found and created sounds of birds and insects. The collision of human civilization and wildlife is both a contemplation of extinction and environmentalism as well as a metaphor for the wild in our psyches and imagination. 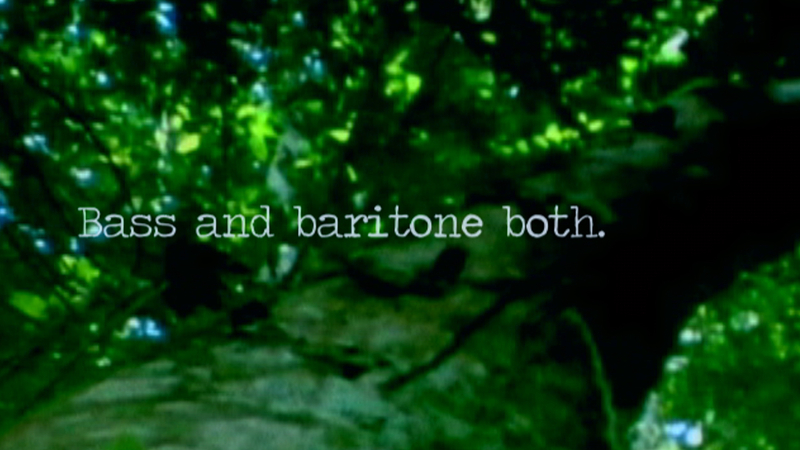 Equal parts musical, performance, and poetic lecture, In The Jungle is an hour long, single channel video written and directed by Stephanie Barber, starring Cricket Arrison (of Wham City) and M.C. A small introduction to this already quotidian 16mm film, 2017, Stephanie Barber. What becomes apparent is the humor possible in material interactions and the tender and sometimes melodramatic symbolism of cut flowers. What begins as a reverence for natural beauty ends up pointing towards the abstract expressionism and color field work of high modernism which, in many cases eschewed the banality of such ‘natural’ beauty. The collaged soundtrack suggests weightier concerns, gently insistent behind the flatness of the utilitarian sounds of ripping tape. This is a short excerpt of a looped meditation on the collision of human domestic spaces and wildlife embodied in the running tiger. This is an element of the first iteration of Nature as a Metaphor for Economic, Emotional and Existential Horror, presented in 2016 at the BMA. It is clear, the grace and beauty of the moving animal, fast and steady through the design magazine photographs. 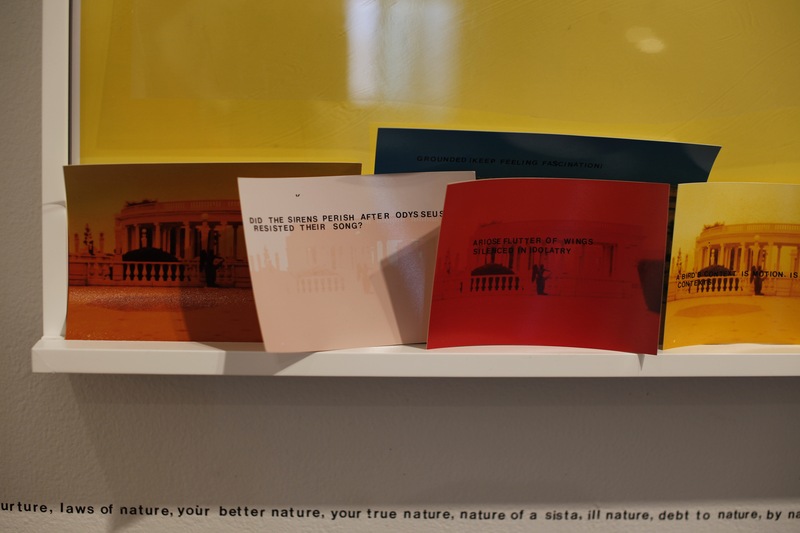 Nature As A Metaphor For Economic, Emotional And Existential Horror, an installation of words and photographs, is a philosophical treatise on the concept of 'nature' through a poetic lens. This work has been featured as solo exhibitions at Capsule Gallery NYC between Oct. 4th and Nov. 16, 2018 and at the School 33 Art Center in Baltimore between Dec. 7 and Feb. 2, 2019. 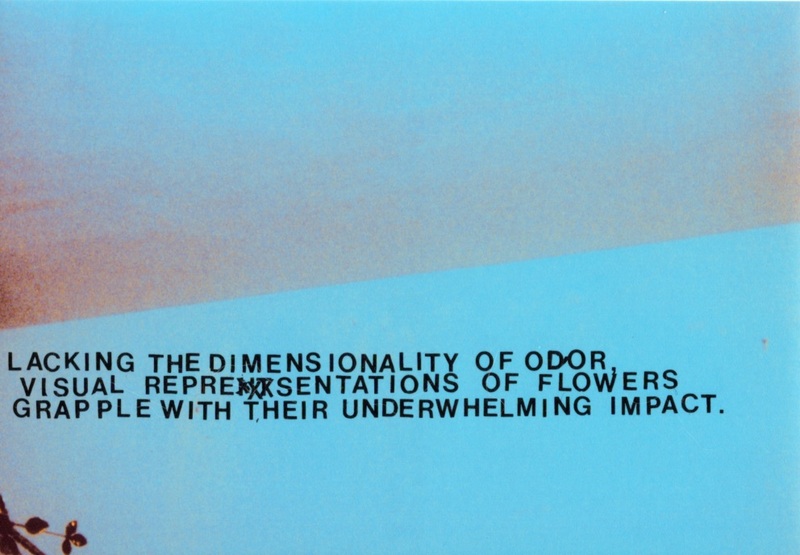 The installations consist of a series of large format photo prints with texts created by hand pressed dry transfer letters; sculpturally constructed frames with inlaid shelves for smaller photo prints with further hand lettered texts; a vending machine with 300 sentences about the nature of economic, emotional and existential horror; 3 viewfinder essays with images and text; acetate scrolls and a single channel video. 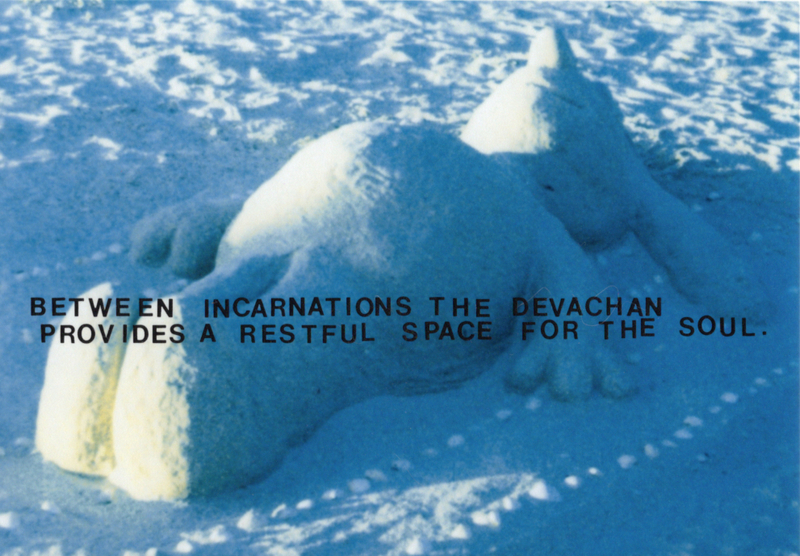 The show is a hybridized essay using photography and text to investigate our understanding of nature as human context. An installation shot at Capsule NYC. Small, hand lettered photographs lean against the large format prints with custom made, shelved frames. A close up of an installation shot at School 33 Art Center, Baltimore MD hand lettered photographs lean against the large format prints with custom made, shelved frames. Text along the wall continues a list of ways we use the word nature. A vending machine full of 300 Sentences About Nature as a Metaphor for Economic, Emotional and Existential Horror. 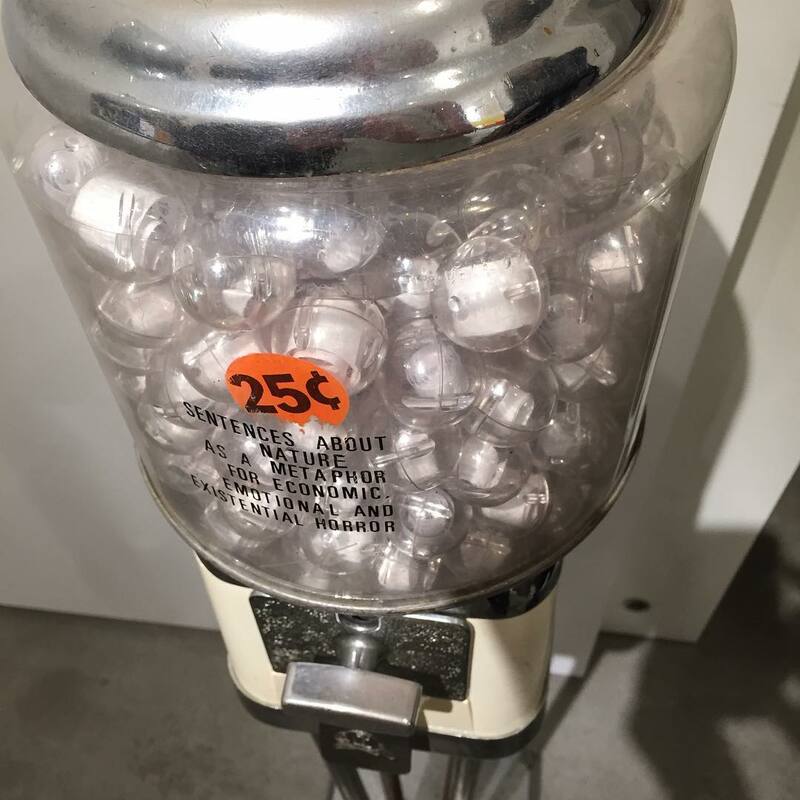 Visitors can buy one or more sentences for 25 cents. Again, the language is the primary aesthetic and conceptual element of this project. A viewfinder essay sits amid hand lettered 4 x 6 hand lettered images at the installation at School 33, Baltimore. 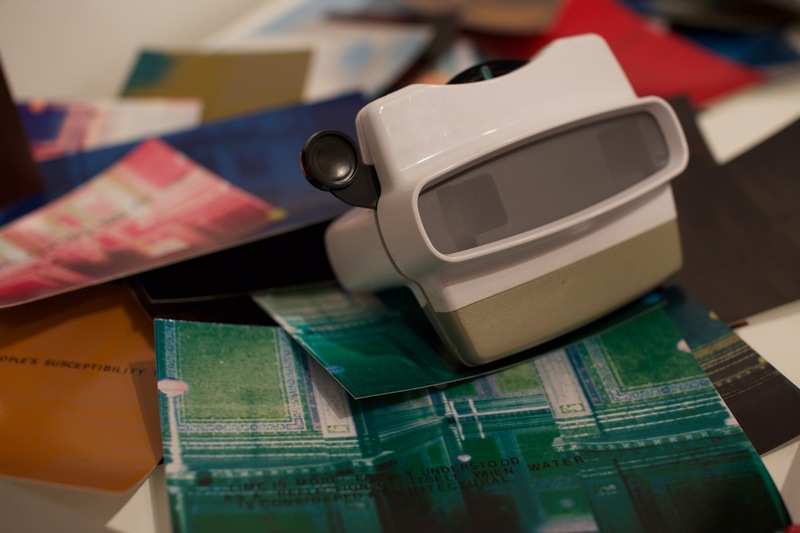 This is gallery shot at Capsule NYC shows visitors reading the 3d viewfinder essays. Hand lettered 4x6 still images move through poetic and philosophical grapplings with the concept of nature. The importance of word choice and conceptual play in the language usage is the primary compositional element of this project. Like a book, torn apart and scattered around a room, the ideas become modular and accumulate through time spent reading. Nature as a Metaphor for Economic, Emotional and Existential Horror presents a poetic, philosophical treatise on the way humans use and understand the concept of 'nature'. Language is used as a conceptual and visual element of the compositions. The hand lettered scrolls echo and summarize the thoughts and questions presented on the still photographs and serve as aesthetic contemplations on our human context. This is a short excerpt of a looped meditation on the collision of human domestic spaces with wildlife embodied in the running tiger. This is an element of the first iteration of Nature as a Metaphor for Economic, Emotional and Existential Horror, presented in 2016 at the BMA. It is clear, the grace and beauty of the moving animal, fast and steady through the design magazine photographs. A feature length narrative written and directed by Stephanie Barber in 2017. Leo Goldsmith at The Village Voice wrote "...Barber’s overabundance of language and logos — her insistence on the artificiality and constructedness of the Scientist’s natural environs — positions the jungle as a space of subconscious play rather than a lost paradise. To return to the jungle — to wrap herself, as the Scientist does, in her serpentine sleeping bag and become a snake with her “snake friends” — is about generating a space of comfort and self-care: a habitat." In The Jungle works in the porous spaces between theater and cinema; essay and fiction; music and poetry. The composite nature of the video extends my exploration of hybridization and multidisciplinary text work in the field of expanded poetics. In The Jungle, playfully and sorrowfully tells the tale of an unreliable narrator in a self-imposed exile. Given a grant to study the equivalent of animal cries and whines in jungle flora our heroine has lived for 1, 612 days deep in an unnamed jungle. The piece opens with a musical journal entry through which we discover that she must return to "civilization" to deliver a lecture on her discoveries to the board which funds her work. The typewriter on which she impresses her thoughts about this upcoming journey is turned into a melodic instrument and accompanied by an antique toy piano and Berg-like vocal punctuations so that the entirety feels like a circuit bent atonal opera. What becomes clear is an encroaching madness and reluctance to leave the sheer terror of thousands of square miles of rapid life and growth. 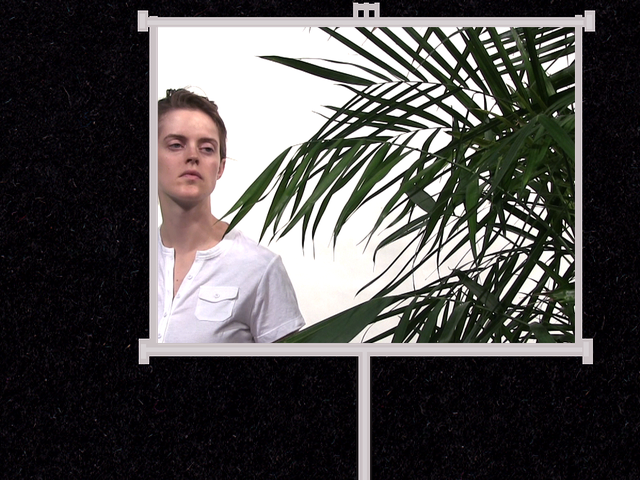 The sets are composed of video images of jungles collaged and projected through and onto the sculptural structures of trees and vines and mosses. The sets so clearly avoiding naturalism call into question our heroine's sense of reality; in this way the form of the piece suggests the unreliable nature of the character and her situation. The jungle serves as an extended metaphor for excessive and continual growth and death and fear and sustenance; a metaphorical space of chaos in which the scientist finds solace and which stands in contrast to the human jungle of "civilization" to which the scientist must return. A lecture on the epiphytic and resiniferous vegetation of the jungle is then delivered. Or rather, it is skillfully, strangely and poetically side-stepped and whipped into an emotional, philosophical frenzy. The lecture folds a poetic narrative into a roving philosophical inquiry and botanical primer. The scientist then returns to the jungle just in time to listen to her favorite radio show which provides the courage and fortification of a direct god line to the jungle floor through a mellifluous dj and prescient pop songs. Mostly she is terrified and interested in being terrified; thinking of all the implications of fear and understanding...the way these two ideas are constantly referenced, metaphorically, in the flora she set out to study. 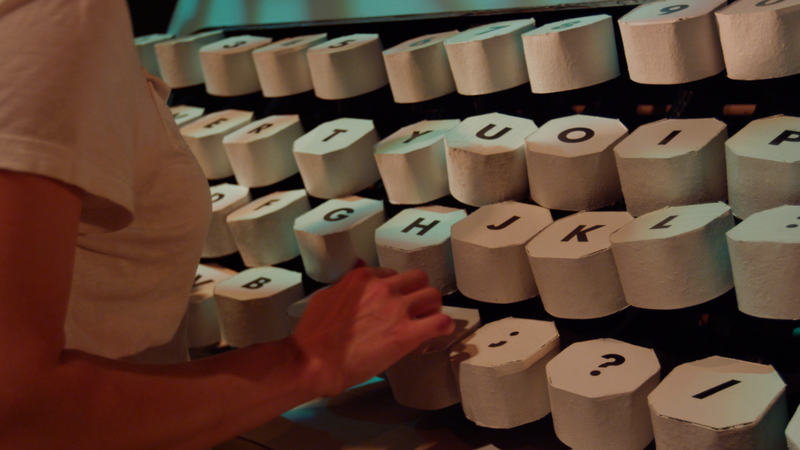 The opening scene is composed of the scientist’s typed journal entry which has been transformed into a musical instrument. The altered typing is accompanied by an antique toy piano and Berg-like vocal punctuations so that the entirety feels like a circuit bent atonal opera. I created the music withfound and created bird, insect and other jungle sounds against an amplified typewriter. What becomes clear is an encroaching madness and reluctance to leave the sheer terror of thousands of square miles of rapid life and death. A still from the first scene of In The Jungle. The scientist types in her journal about the trip she will take back to 'civilization'. 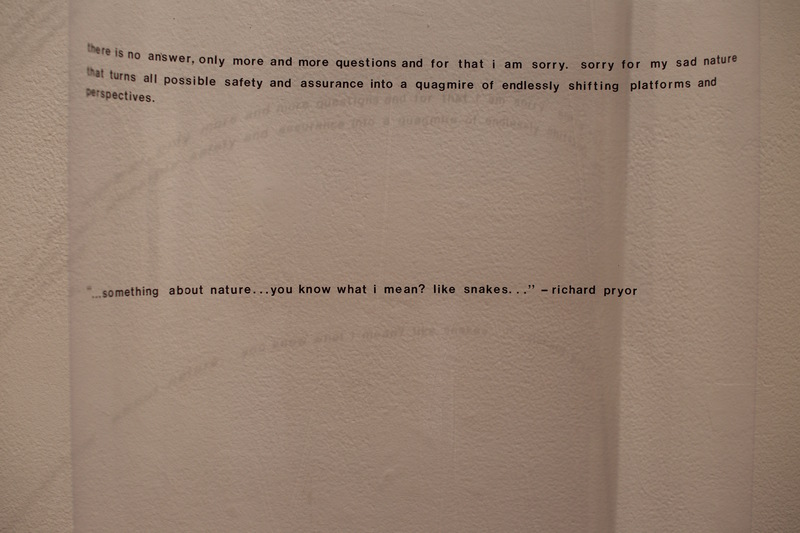 The words are typed upon the flora of jungle as the sound track, an atonal opera composed of the found and constructed sounds of birds and insects and typewriter keys, reaches a peak of frustration and ridiculousness. As with much of my work the language is both a conceptual and visual element of the composition. The scientist delivers a lecture to her granting committee on her work studying the way jungle flora expresses sorrow. When the scientist returns to the jungle after delivering her lecture, she is just in time to listen to her favorite radio show on WJNG. The show provides the courage and fortification of a direct god line to the jungle floor through a mellifluous dj and prescient pop songs. 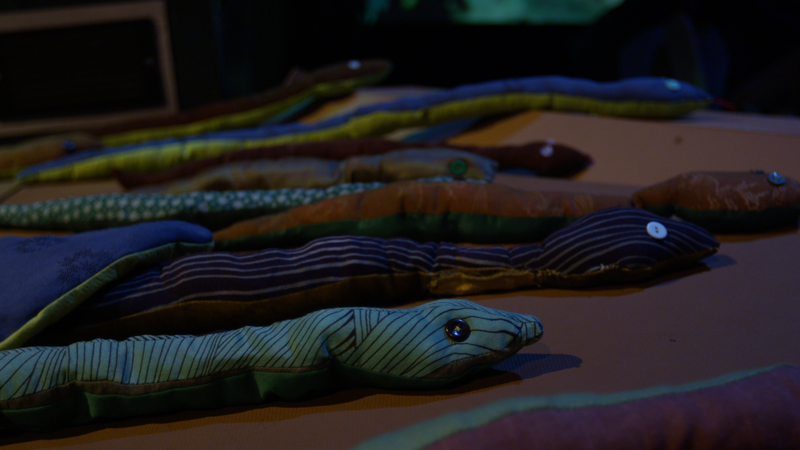 The scientist listens to the radio show with a number of snakes. The Scientist is able to call in to the radio program and speak a bit to The DJ and request a song. 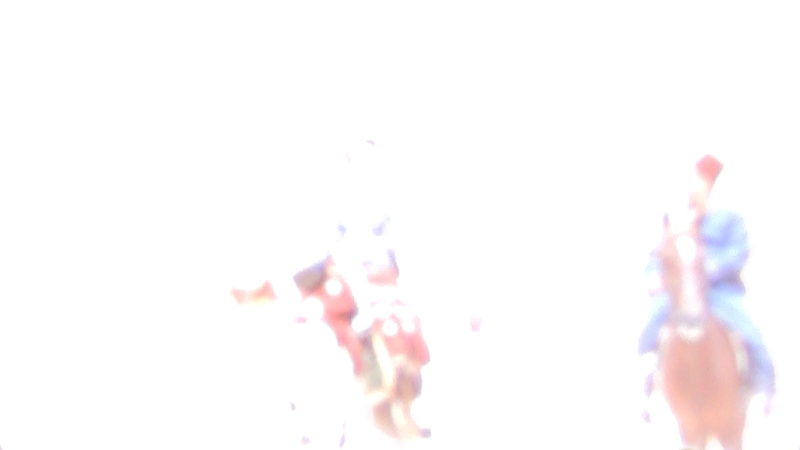 This is an excerpt from the last scene of the feature length video In The Jungle. The Scientist has returned to the jungle after delivering her lecture just in time to listen to her favorite radio station where The DJ serves as an alternately sardonic and consoling god-like presence through the jungle ether and radio waves. Between the three acts the sets of the scenes are changed by stage hands who serve as dancers, visible & choreographed. 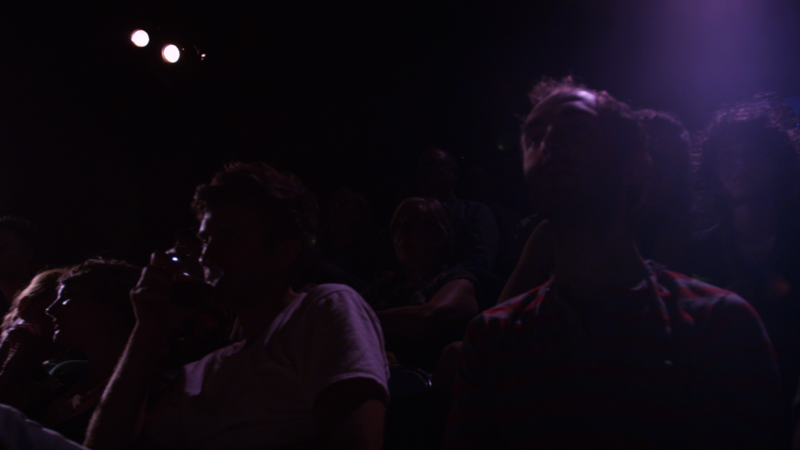 As the stage hands change the sets the camera does a 5 minute 360 degree pan and tilt around the theatre and reveals that the entirety of the film is a theatre piece with a live audience. 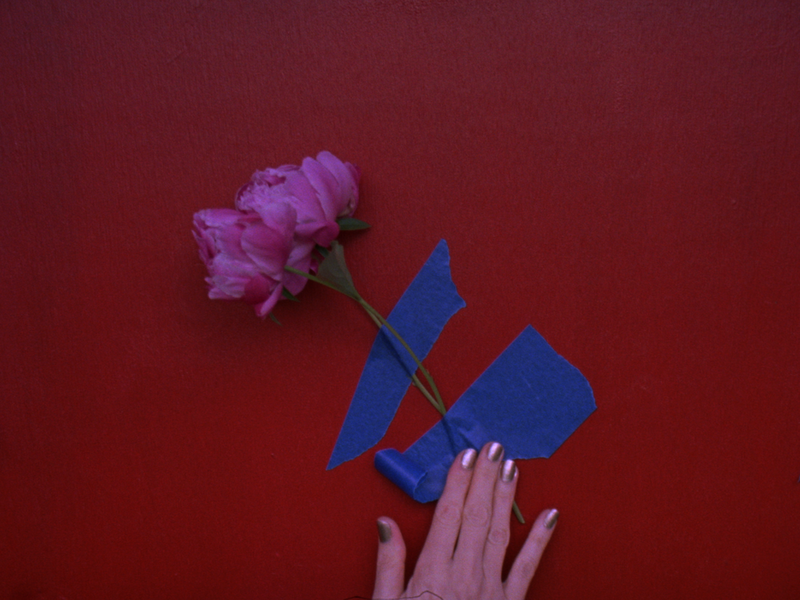 3 peonies is a brief, poetic 16mm film on a simple sculptural action. What becomes apparent is the humor possible in material interactions and the tender and sometimes melodramatic symbolism of cut flowers. What begins as a reverence for natural beauty ends up pointing towards the abstract expressionism and color field work of high modernism which, in many cases eschewed the banality of such ‘natural’ beauty. The collaged soundtrack suggests weightier concerns, gently insistent behind the flatness of the utilitarian sounds of ripping tape. While the last 7 years I have been creating feature films and book length writing--expanding my notions of time--these short, experimental, poetic film and video work have been a mainstay of my artistic practice and I have and will continue to, create these more condensed pieces throughout my life. Has screened at Media City Film Festival, Windsor/Detroit 2018; Image Contre Nature 18, Marseille, France 2018; European Media Arts Festival Osnabrück, Germany 2018; IndieLisboa, Portugal 2018; Cue Mark Lubov Gallery, NYC 2017; Antimatter Film Festival, Victoria BC 2017 among others. A short, poetic 16mm film from 2017. 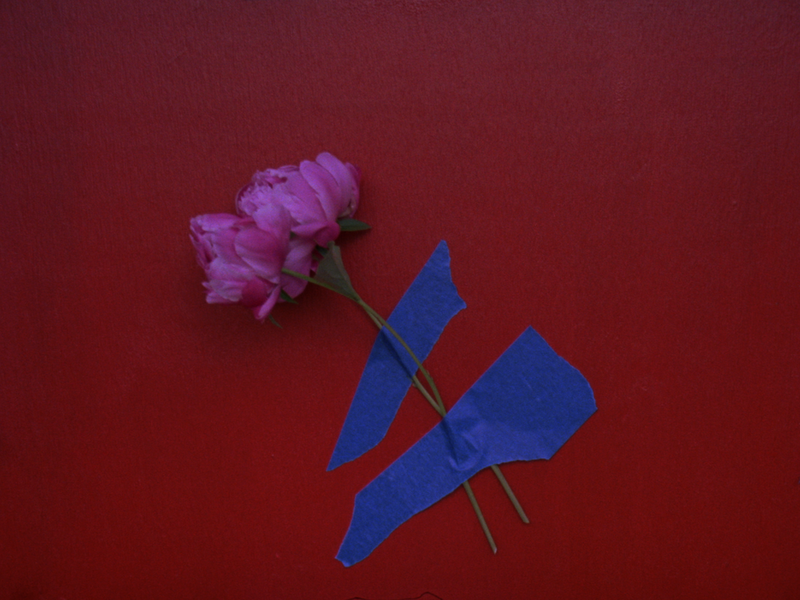 Three peonies are taped to a red ground until entirely covered with blue painters tape. What begins as a portrait of flowers, a nod to the beauty and delicacy so lauded in Dutch floral painting, turns to a piece reminiscent of modernist painters as the tape covers the stems and buds of the flowers. This is a film which is playing at being a sculpture. Published by Ink Press Productions in June 2015, All The People is a collection of 43 very short stories. The stories sit carefully between poetry and story. Like much of my work, they are interested in the upsetting of genre and media as an element of the project. All The People wants to be a book of photographs, an album of songs or treatise on need. Laura van den Berg at Entropy Magazine wrote "All the People is a work that resists easy categorization, and certainly Barber is stretching and complicating the form of the micro-story or the flash fiction or whatever we want to call it here; she is capturing that form and making it wholly her own. 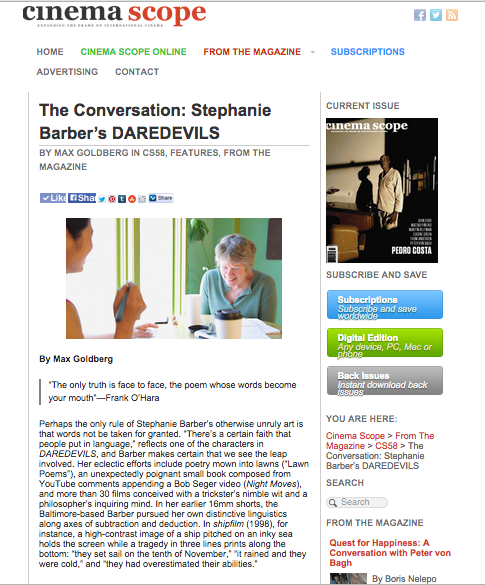 I could try out comparisons—Deb Olin Unferth meets Lydia Davis, say—but Stephanie Barber continues to prove herself as a true original." 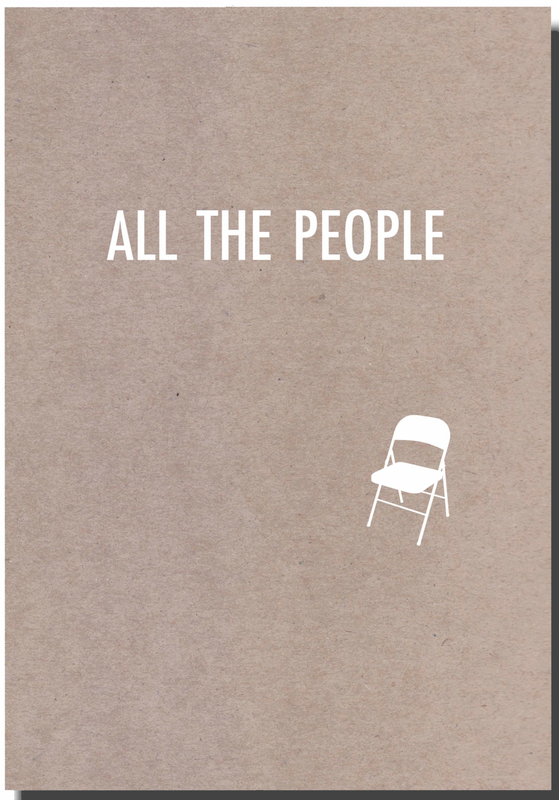 ALL THE PEOPLE is a collection of very short stories which the press Ink Press Productions published in 2015. The 43rd story from ALL THE PEOPLE. 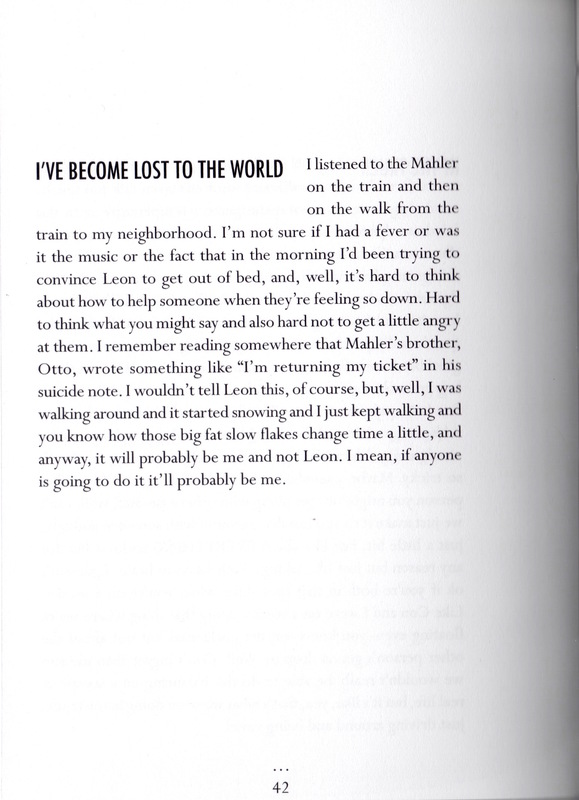 In this short story a man contemplates his lover's depression as he walks home from the train. A young girl thinks about the groundskeeper at her family's summer home. ALL THE PEOPLE is an attempt to give voice to many different americans from diverse ages, races, classes and genders. This interview between Laura van den Berg and I at BOMB magazine about the publication of ALL THE PEOPLE. 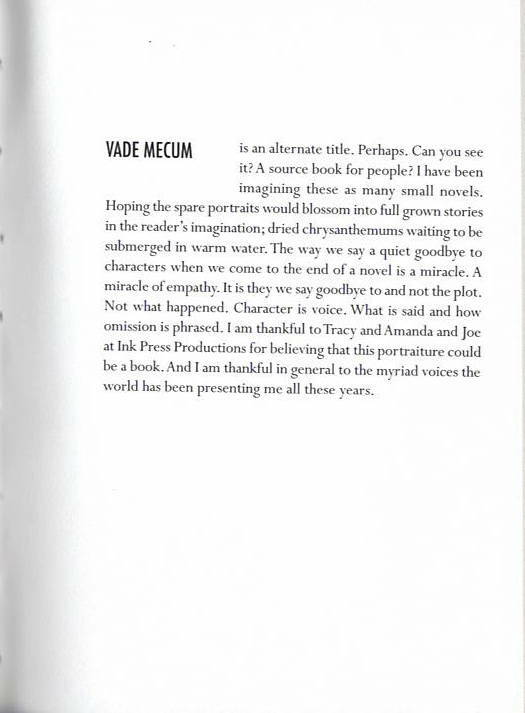 This is an author's note at the end of the book. A bit of a mission statement, though still playful. Horizon is a short experimental video. The piece is a poetic collage of 16mm home movie footage from Egypt in the 1950s, elements of Capra's "Lost Horizon" soundtrack and a small and frustrated boy. 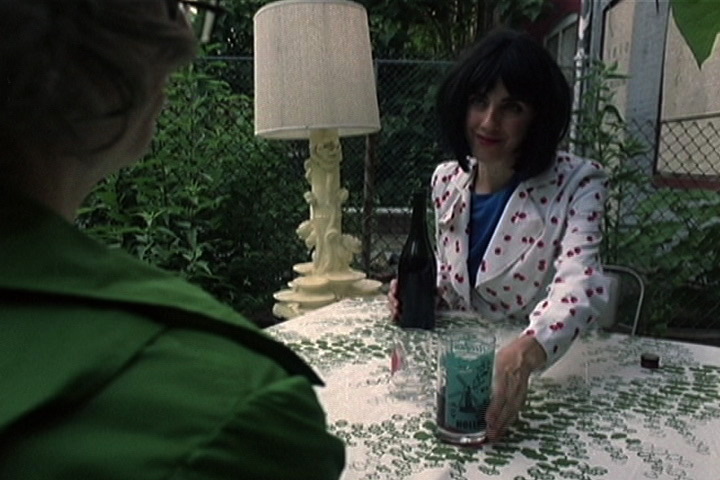 The 16mm footage was shot by a wealthy American couple on their 3 year, around the world honeymoon trip. 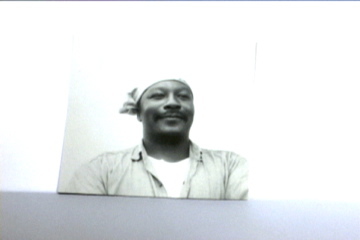 My mother was their maid for 25 years until they passed away recently and I received all of the film footage. I constructed this collage which contemplates the concept of utopia and holds a critique of the American class system and the way it is visible through markers such as language usage. While the last 7 years I have been creating feature films and expanding my notions of cinematic time, short, experimental, poetic film and video work has been a mainstay of my artistic practice and I have and will continue to create these more condensed pieces throughout my life. Horizon premiered at The New York Film Festival and has since screened at The Edinburgh Film Festival; KLEX, Kuala Lampur; Fronteira Festiva, Brazil; Manchester Film Festival and others. Still of the short, poetic film "Horizon" made in 2014. A brief poetic collage of 16mm home movie footage from Egypt in the 1950s along with elements of Capra's Lost Horizon soundtrack interwoven with recordings of a small and frustrated boy. The original footage was given to me by my mother, who worked some 30 years as a maid for the millionaire couple who shot this while on a 4 year, around-the-world honeymoon trip. 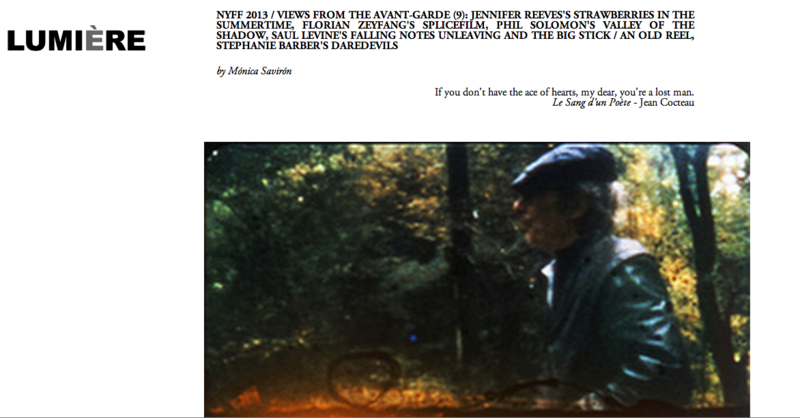 This feature film premiered October, 2013 at New York Film Festival's Views from the Avant-Garde. A portrait of risk and language, the experimental narrative DAREDEVILS, presents a writer as she interviews a well-known artist and feels the reverberations of their discussion throughout her day. Visually spare, still and verbose, the video considers three formal handlings of language—a dialog, two monologues and a song. 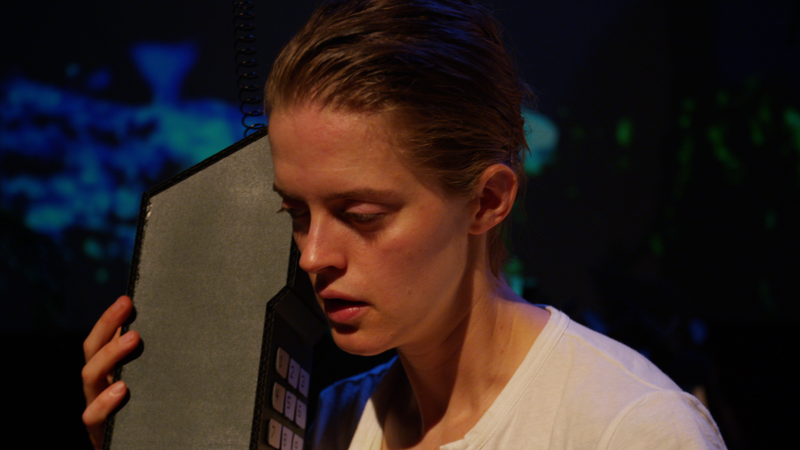 Starring KimSu Theiler, Flora Coker & Adam Robinson and featuring the voices of Susan Howe and Jenny Graf, DAREDEVILS constructs a metaphor of an artist’s life and work as daredevilry. The trailer for the new feature DAREDEVILS written and directed by Stephanie Barber. 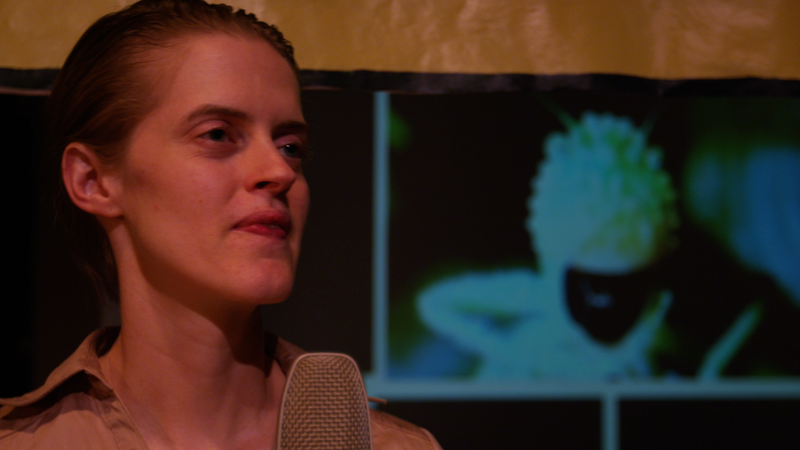 Actor Flora Coker plays an artist who is interviewed by a writer played by KimSu Theiler. This is a short excerpt from the first scene of DAREDEVILS. 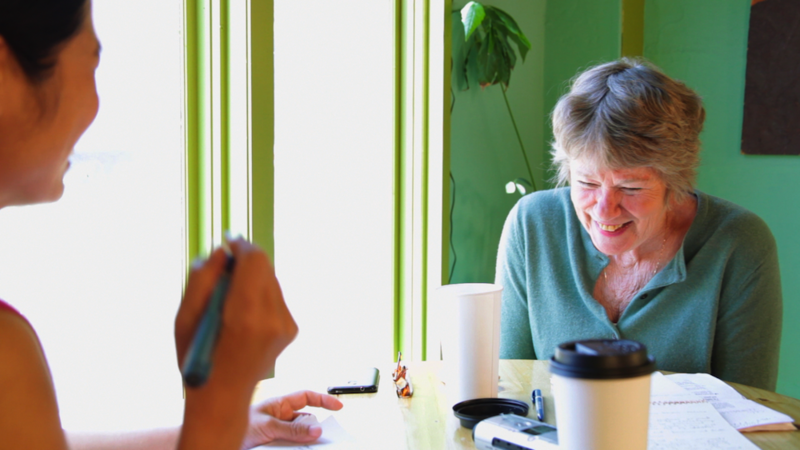 The Writer, played by KimSu Theiler, interviews the fictional artist played by Flora Coker about her work and life and ideas. The script is carefully constructed to suggest an initial awkwardness as the conversation begins, and then move to the traditional question/answer format of an interview to moments of natural conversational exchanges to an abrupt ending. Actor KimSu Theiler in the jogging scene. 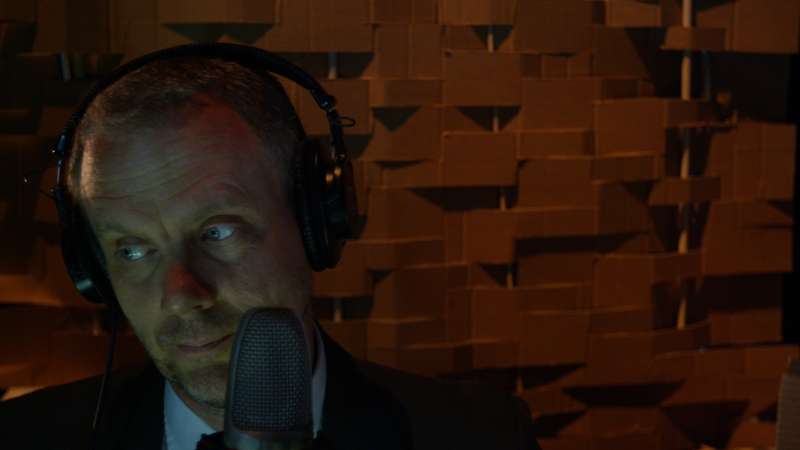 This second scene, after the interview, watches The Writer jog while listening to a podcast interview with a daredevil and hollywood stunt actor. 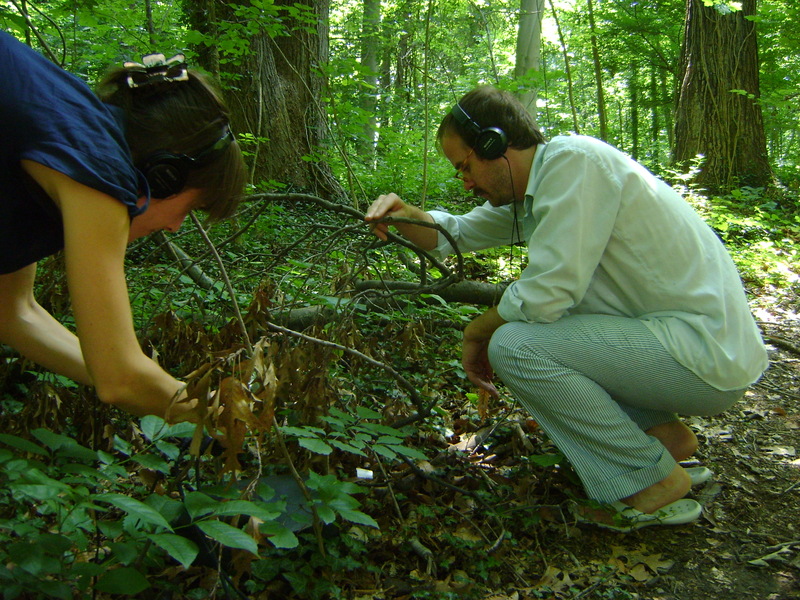 Director Stephanie Barber setting up one of the recording scenes in which Adam Robinson plays the role of a musician recording the sounds of branches, logs, rocks and leaves. 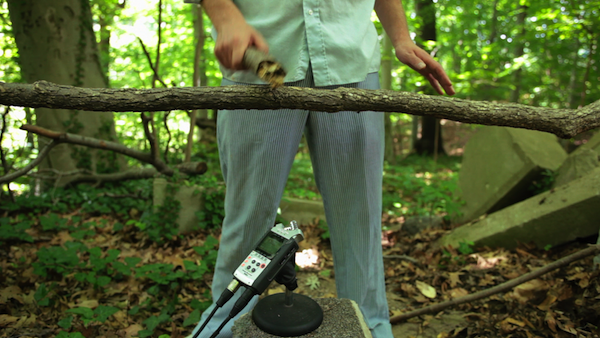 Actor Adam Robinson, whose character is in the woods recording sounds for a song his character composes. These recording scenes are sprinkled throughout the film and interrupt the 3 main scenes. Actor Kimsu Theiler in final dance scene of DAREDEVILS. 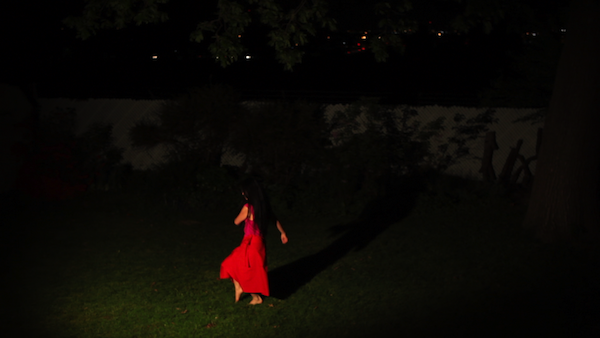 The writer, played by KimSu Theiler, returns home after a long day and dances in the backyard. Her dance moves between silly and sublime, sorrowful and joyful. After jogging The Writer returns home where The Musician is recording the vocal track for a song he has made with his recordings in the woods. “Hey birds, will you all fly away? Hey birds, will you all fly away? 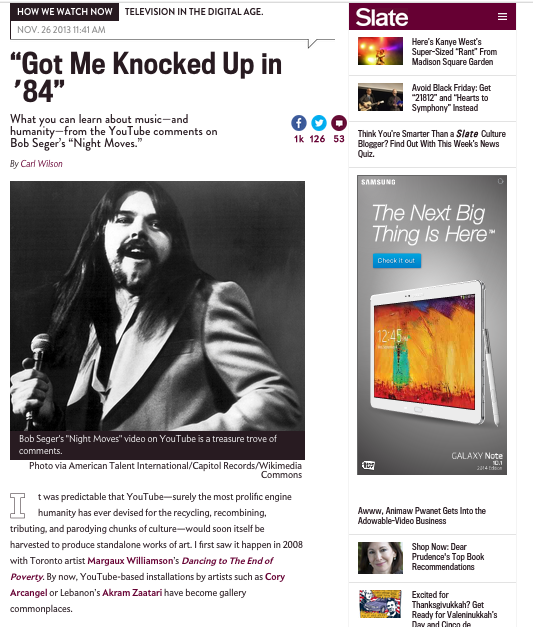 The book is a collection of thoughts and conversations about Bob Seger's classic song of the same name, all culled from YouTube. Poignant, disturbing and incisive, the collection deepens and takes on a cultural significance beyond the initial artistic impetus. 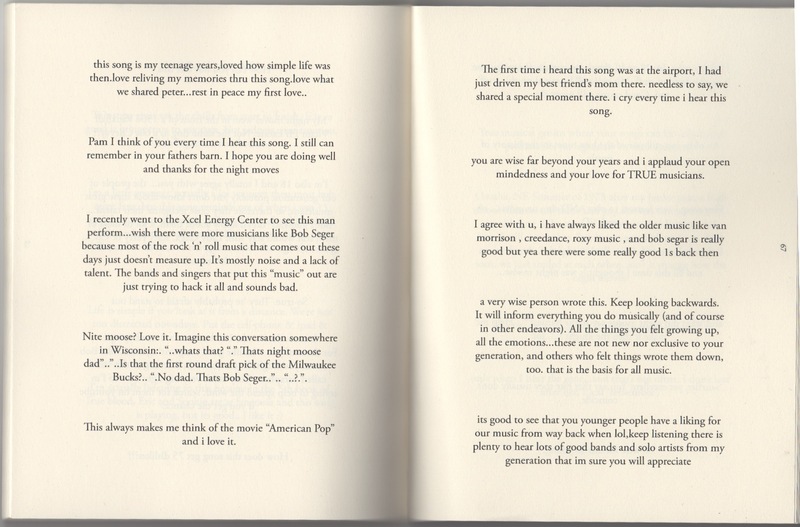 A collaboration is created—twisting through the nostalgia for youth and the collective ownership of pop music, the book becomes a moving document of how strangers communicate about art, and what the song and the sentiment of the song means to different people. 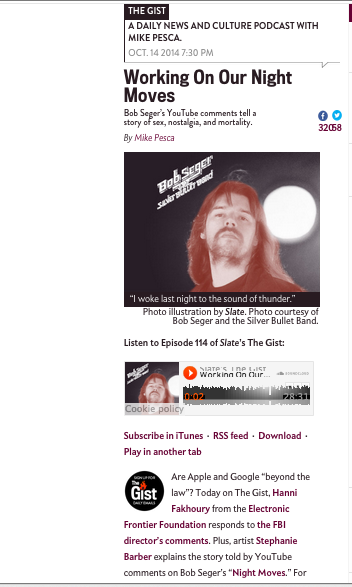 Carl Wilson at Slate Magazine wrote "It’s in these alternations between poignancy and repugnance, the tender and the foul-mouthed, the clichés and the arresting confessions, separated by bubbles of white space, that Barber discovers the poetry of the comment section. Her gesture here goes back, of course, to Marcel Duchamp and all the conceptual art since that has been produced by putting a frame around a found object. 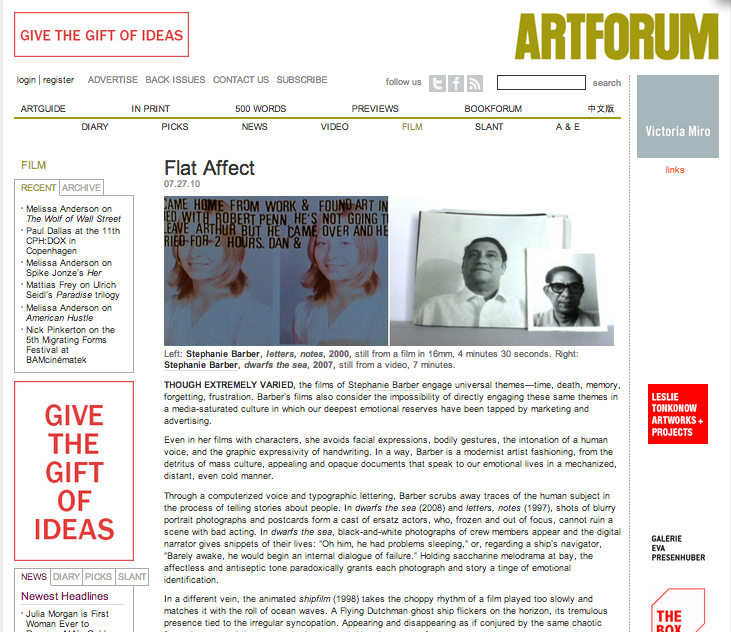 (She often collages found images into her video work as well.)" about Night Moves. Blake Butler at Vice Magazine wrote "The anonymous and wide-open freedom, when orchestrated under independent Baltimore filmmaker Stephanie Barber’s eye, quickly culminates into a narrative built from sentimental dedications, troll-bait insults, wistful old folks angry over how music has changed, defensive teens, lurkers, hornballs, the incredulous, the sincere, and a whole other range of personalities that would only intersect with one another online." Published by Publishing Genius Press in February 2013. 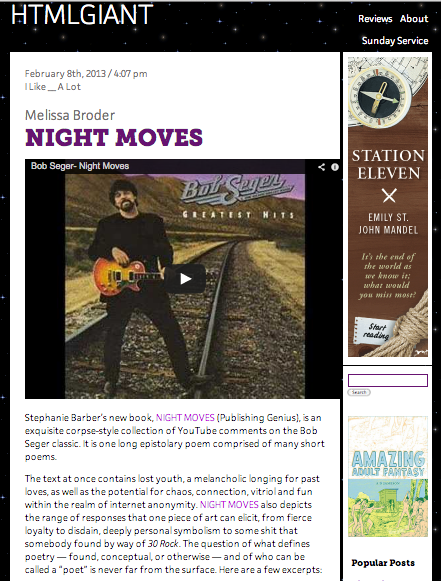 Stephanie Barber interviewed by Mike Pesca about her book Night Moves. 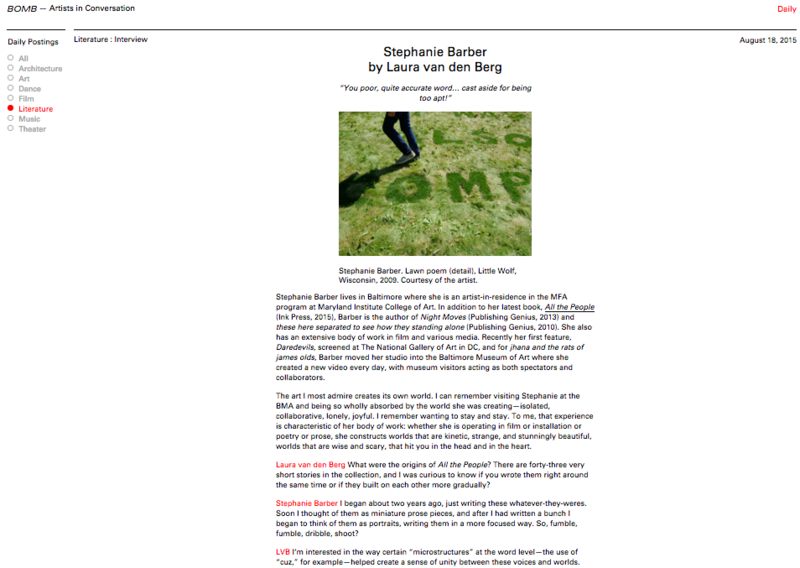 Oct. 14, 2014, Stephanie Barber interviewed by Mike Pesca at The Gist. 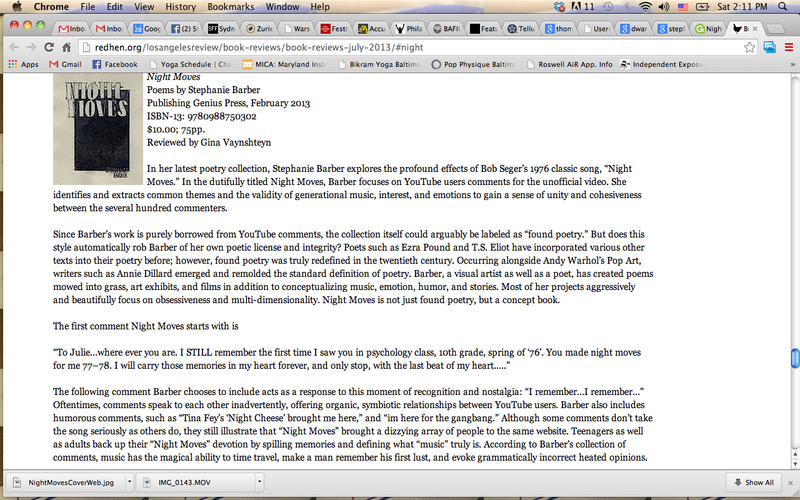 listen here: https://soundcloud.com/thegist/working-on-our-night-moves-2 Book interview begins at 11'45"
Gina Vaynshteyn reviews Night Moves at Los Angeles Review of Books, July 2013. 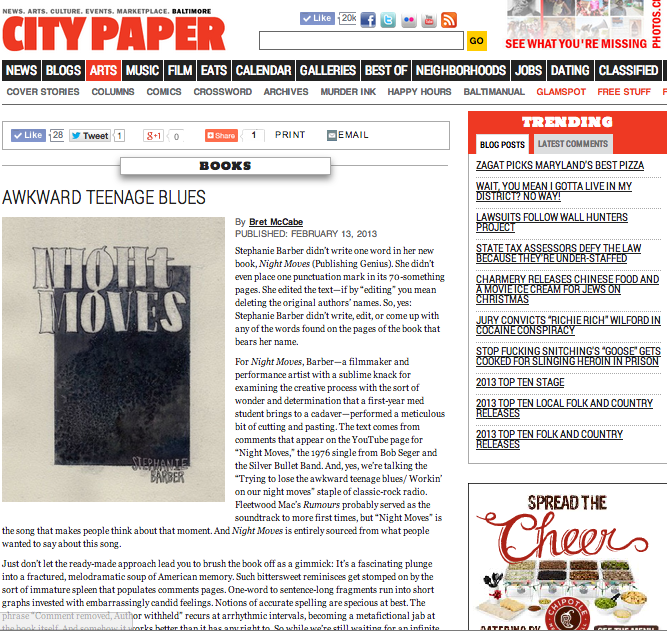 Bret McCabe reviews Night Moves at the Baltimore City Paper. 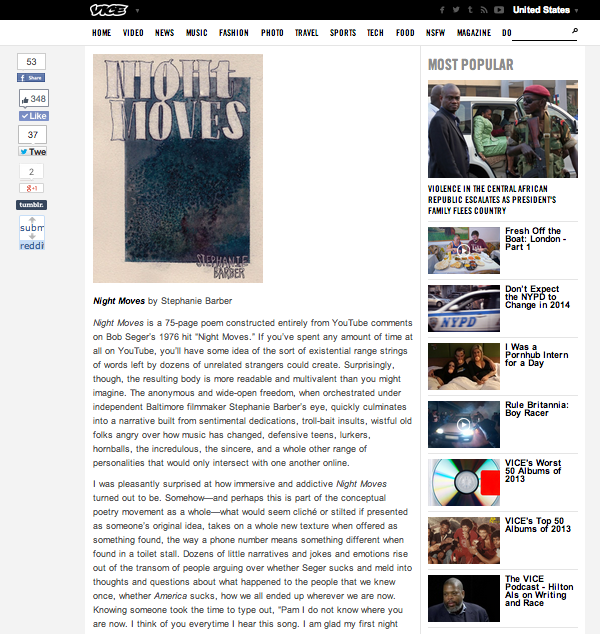 Carl Wilson reviews Night Moves at Slate Magazine. Nov. 2013. 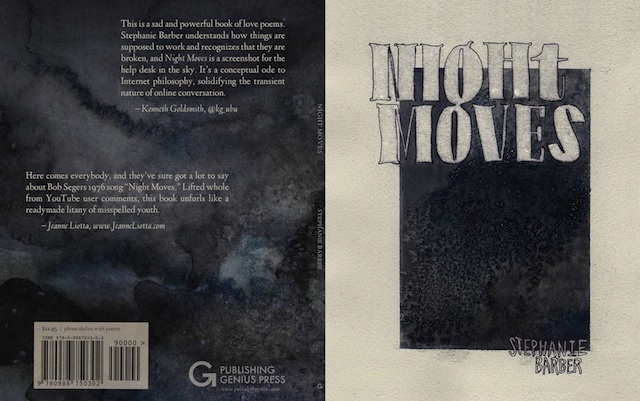 2 pages from the conceptual book Night Moves.Night Moves is recognition and celebration of a very ubiquitous collaborative critical inquiry that is happening on YouTube or any online community where people share and comment and discuss in a public way. It is a recognition and celebration of the very tenuous (at turns beautiful or cruel) nature of democratic discourse with all its wonders and perversions on display. 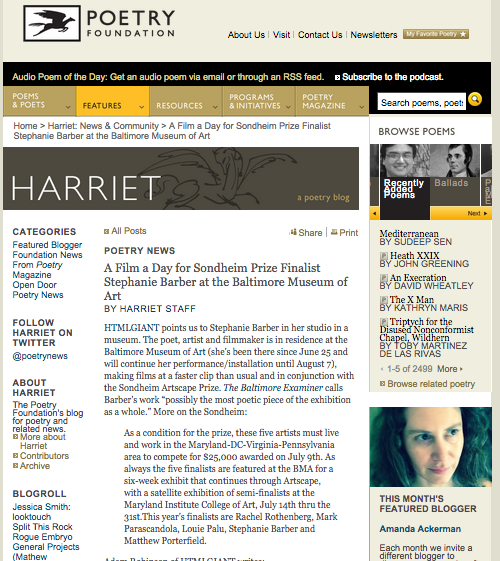 Between June 25th-Aug. 7th 2011 Stephanie Barber moved her studio into the Baltimore Museum of Art where she created a new video each day in a central gallery open to museum visitors. Jhana is a meditative state and James Olds is the protoneuroscientist who discovered the pleasure or reward center of the human brain by doing experiments on rats. The goal of this project, entitled jhana and the rats of james olds or 31 days/31 videos, was to create a series of short, poetic videos in the playful and serious footprints of Oulipo games and daily meditations; creating one new video each day. 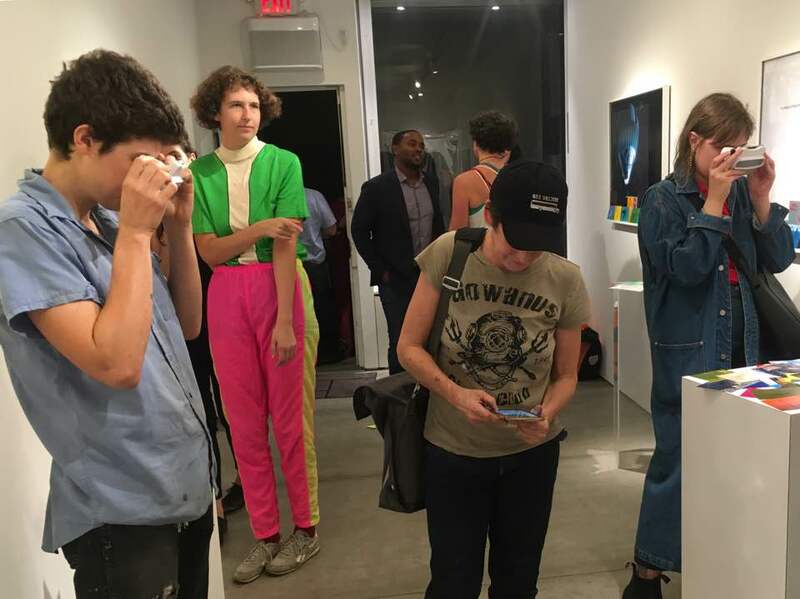 The exhibit was both a constantly changing installation as well as a collaborative performance in which museum visitors were present as spectator and often creative partner. Each of these videos was created on one of the exhibition days. "I am thinking about the emphasis given to product over production, or display over creation. 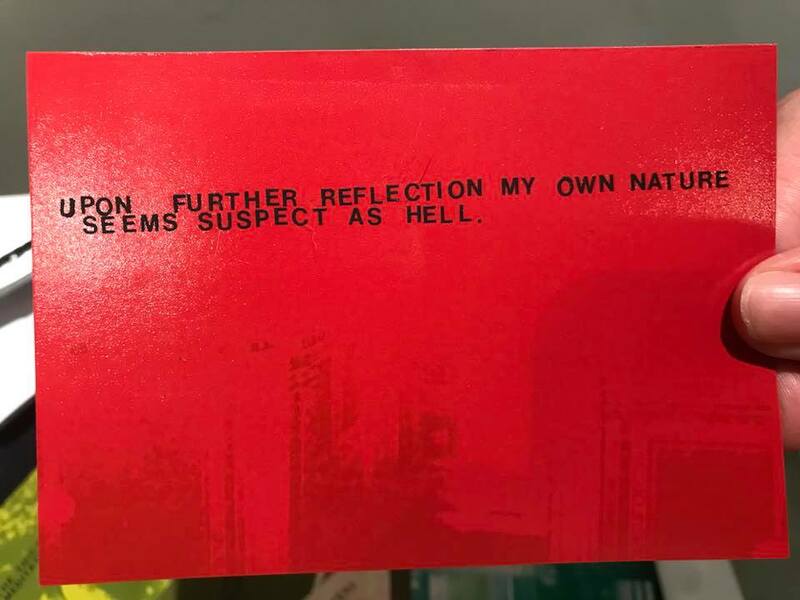 The piece is a video screening and an installation and a performance; a spiritual obeisance, an athletic braggadocio, a consideration of marxist theories of production (with the assembly line so lovingly lit). It is a funny game for me to play, an exercise in concentration, discipline and focus, an extension of my everyday. It is a greedy desire to squeeze a massive amount of work out of myself; a dare; a show I would like to see myself. It is like the back story before the story, an inversion of the way we usually experience art work. A moving from the inside out. This is a short excerpt from a 50 minute film in which 689 people say "I Love You" one after another. All the people in the piece were passing through the exhibit and agreed to be in this piece. 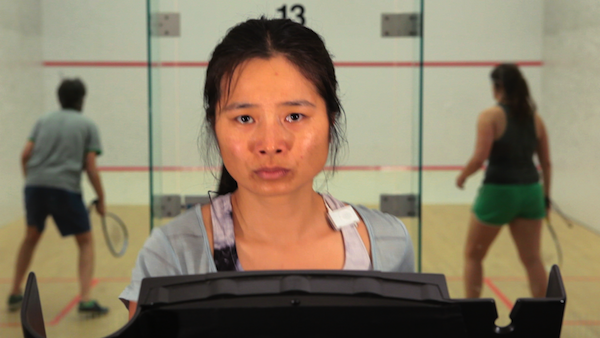 Stephanie Barber | U.S. | 2011 | 2m color | sound | DV from Jhana and the Rats of James Olds A series of sentences read by museum visitors inspired by, and paired with, a number of miniature Elizabethan portraits. Words and paintings? ?each seem equally able and unable to represent a life. The man who reads the line ?I think constantly about my coming demise? came through the exhibition several times and participated in a few different pieces. He is big, young, strong and confident. I had him read the line many times before he got it just right. A musical telling of an old chinese myth. Made in collaboration with Smelling Salt Amusements. 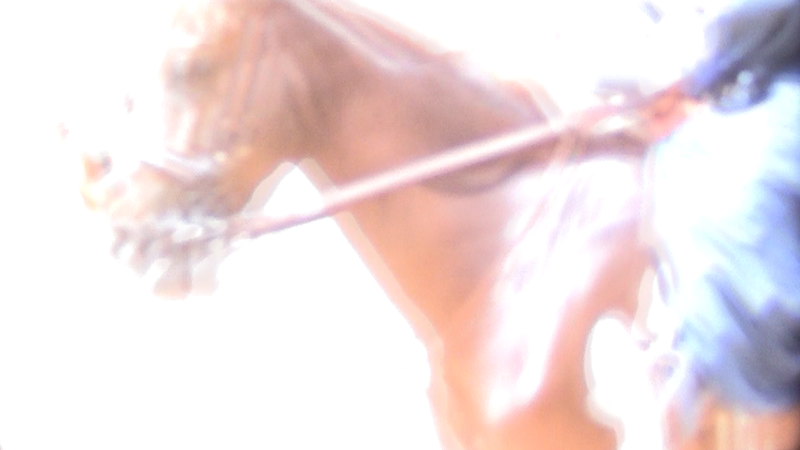 DEGAS from Jhana and the Rats of James Olds 1 min / digital / sound / 2011 It is not only that his first and last names are near anagrams of each other or that his paintings of horses are paintings of motion reorganized to suggest docility and submission, earth toned to make the colored silks of riders pop. There is more about Degas that gives us pleasure. More than Degas I am continually fascinated by what passes for biography–a timeline; a portrait; a solemn or inane anecdote. These all seem equally plausible. SOME ANIMALS from Jhana and the Rats of James Olds is a song created by the presence or absence of these images of animals. The patterning of sound sound sound repeating like the shapes which make a giraffe's coat or the molecules of steam which flow from the bison's broad nose as he exhales the scent of a wildflower. Between June 25th-Aug. 7th 2011 Stephanie Barber moved her studio into the Baltimore Museum of Art where she created a new video each day in a central gallery open to museum visitors. from Jhana and the Rats of James Olds The solar eclipse of May 28 in 1900 is part of the Saros Cycle 126. It was, as all eclipses are, not a result of any more or less motion but an expected interruption along our usual path. A shading that reminds us that we are moving and that other celestial objects are moving also. 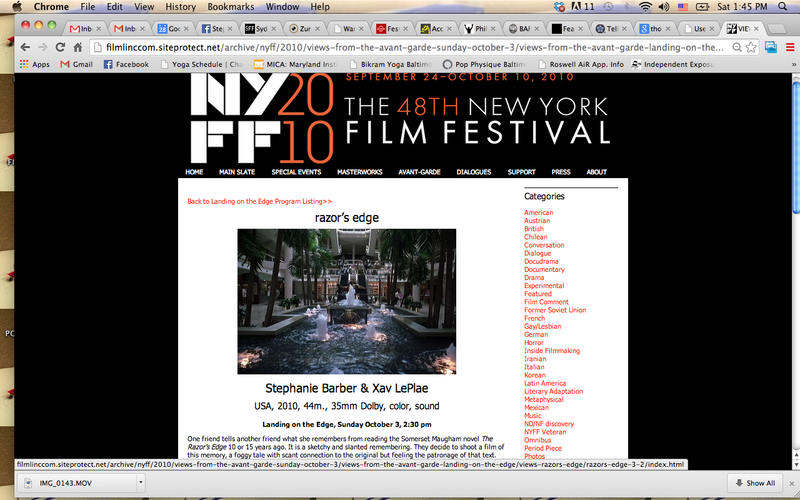 razor's edge is a 35mm feature film by Stephanie Barber and Xavier Leplae completed in 2010. The film is a remake of the Somerset Maugham novel The Razor's Edge written, created and performed by Stephanie Barber and Wisconsin Artist Xav Leplae. The entire piece is shot in Baltimore, in the alleys and barber shops, sno-cone shacks, abandoned buildings and mall-like harbor. 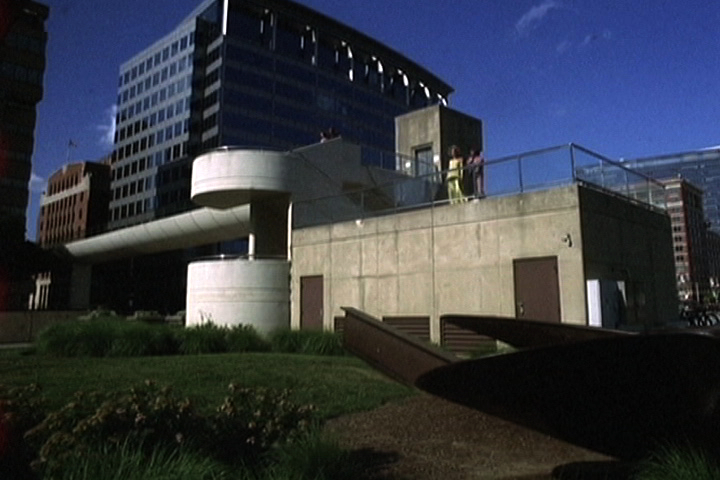 The film premiered at The New York Film Festival's Views from the Avant-Garde in 2010. One friend tells another friend what she remembers from reading the Somerset Maugham novel The Razors Edge 10 or 15 years ago. It is a sketchy and slanted remembering. They decide to shoot a film of this memory, a foggy tale with scant connection to the original but feeling the patronage of that text. Being artists and tricksters they do it as a game, all in one week, with donated short ends and gestural implications to narrative. What they really do is visit after years of not visiting. Endless talks about the state of the planet and our access to knowledge--power or ineptitude of art. 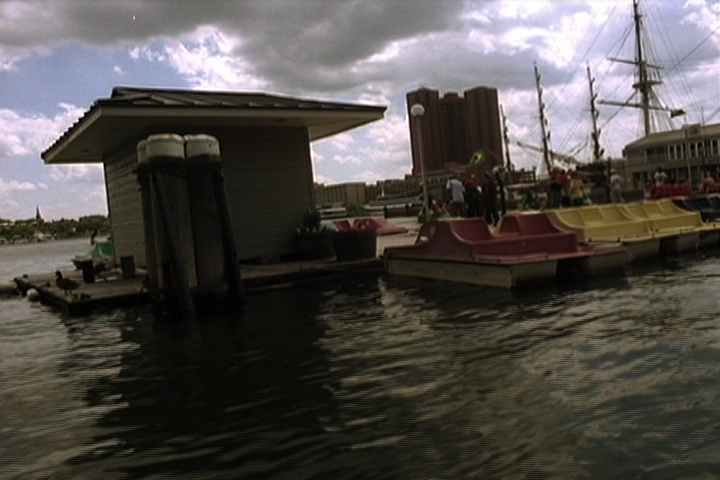 All this talking and the film turns out with almost no dialog, sweeps through the city of Baltimore which is often destitute, tropical and friendly. Max Goldberg at the San Francisco Cinematheque wrote "The spine of razor’s edge is a gliding series of lyrical panoramas of narrow houses. It’s a familiar vantage, but the filmmakers stick with it for long enough to register the varying signs of activity and desertion, beauty and poverty, the weeds and kiddie pools and clotheslines and fences evoking a jungle’s density. At times the deep shadows of the buildings throw the camera into darkness, and it is difficult to tell whether it is day or night. I find razor’s edgealternating currents intriguing, though the film’s cryptic tactics will doubtlessly alienate some viewers. Learning that it was made with the faint memory of W. Somerset Maugham’s The Razor’s Edge in mind won’t clear anything up, but those willing to suspend expectations may find that Barber and Leplae have reconstituted urban space a playground. Instead of plugging gaps with pop music, they sing to themselves." 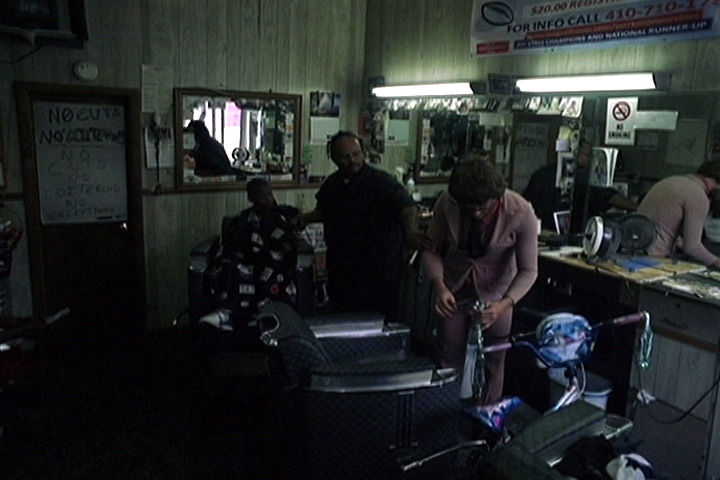 This scene in my neighbor JoJo's barber shop in Baltimore is one of several scenes in which the main character, who has returned home from war a bit lost, attempts to find a job. 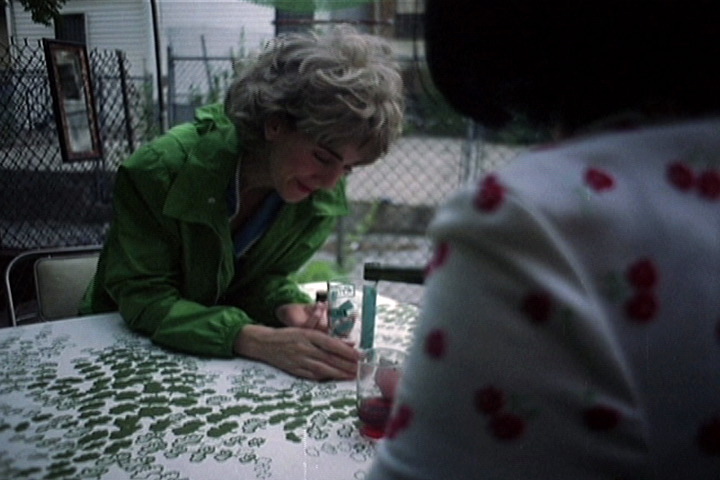 Excerpt from RAZOR'S EDGE This 35mm film was shot in Baltimore, this alley scene is halfway through the video and symbolizes a searching destitution that the characters feel as they move towards rehabilitation. These alleys were shot in my neighborhood which is riddled with poverty, abandonment and moments of unexpected joy. 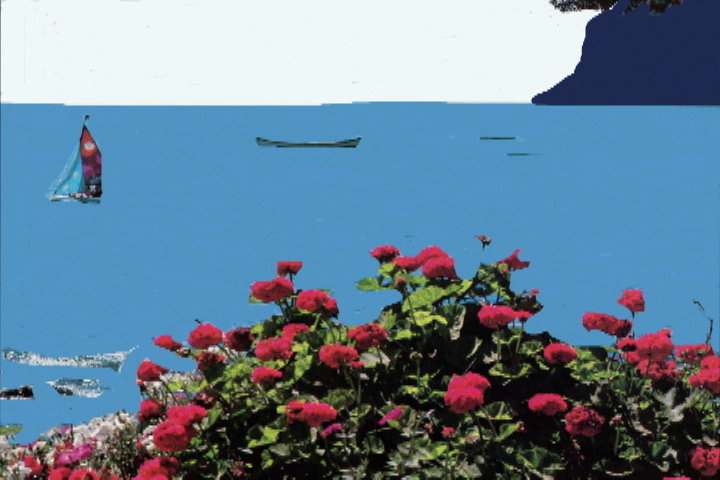 dwarfs the sea is an experimental video composed of a series of found photographs and imagined texts written about the subjects of the video. Small biographies and musing generalizations--men's relations to each other and their lives. There is hope and loneliness, companionship and isolation and the simplest of filmic elements to contrast the complexity of human emotions. The delicacy of the formalist writing moves the listener from intimacy to universalism and back again, swaying gently to and fro like the rocking of a ship. 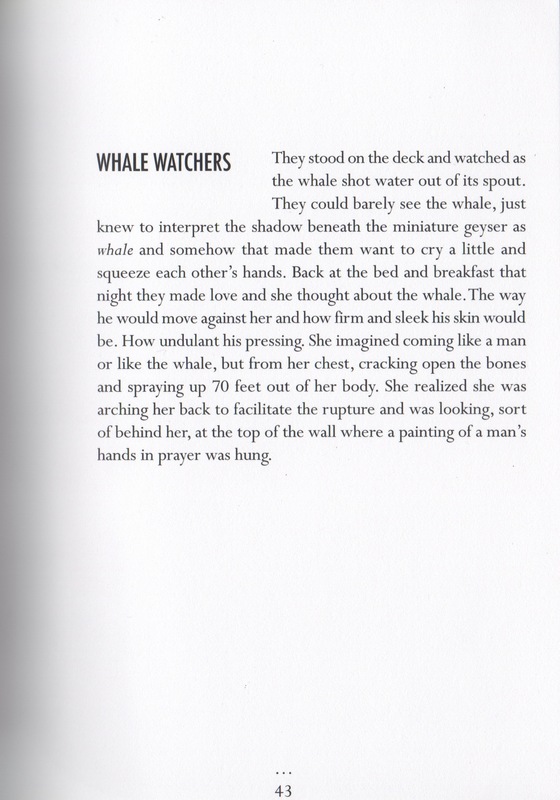 James Glisson, at ArtForum wrote "In dwarfs the sea, black-and-white photographs of crew members appear and the digital narrator gives snippets of their lives: “Oh him, he had problems sleeping,” or, regarding a ship’s navigator, “Barely awake, he would begin an internal dialogue of failure.” Holding saccharine melodrama at bay, the affectless and antiseptic tone paradoxically grants each photograph and story a tinge of emotional identification." 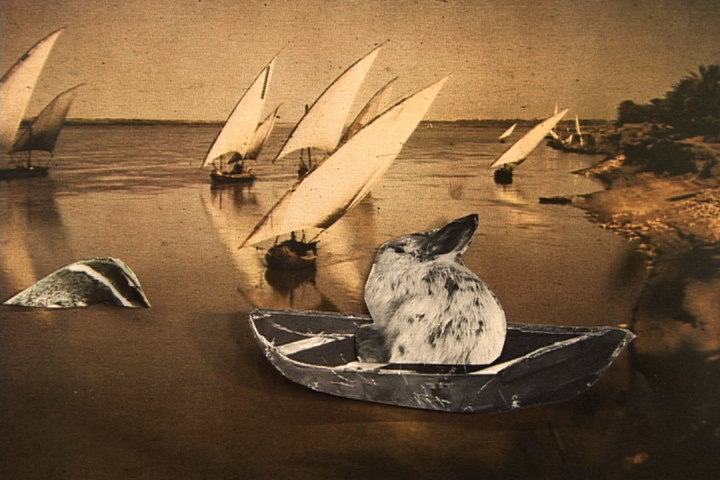 A still from the video dwarfs the sea. A series of still photographs or men and imagined biographies told through a disembodied voice. A short excerpt from the 8 minute single channel video 'dwarfs the sea'. 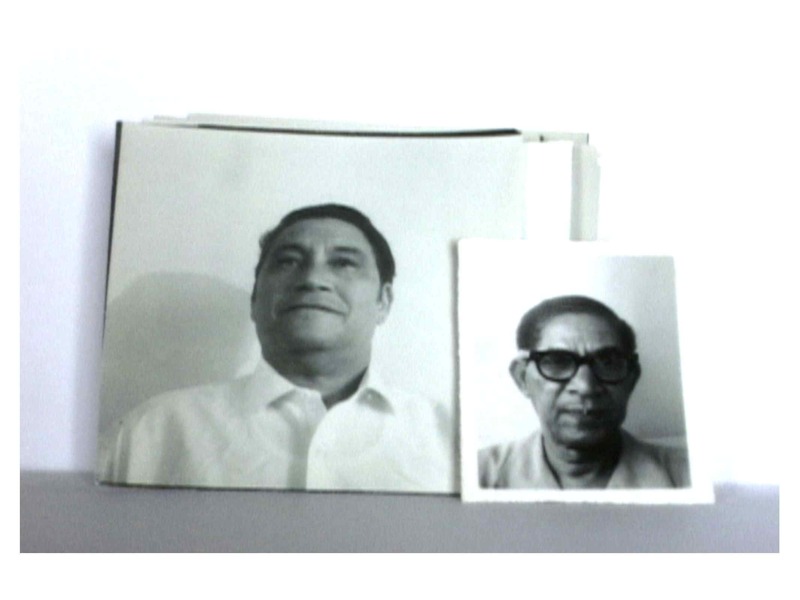 I found this collection of photographs and tried to imagine who these men might be, if they knew each other, what sort of work they did. My own short time working on a sailboat as an AB in the North Sea has given me a love and romanticization for the sailors life. 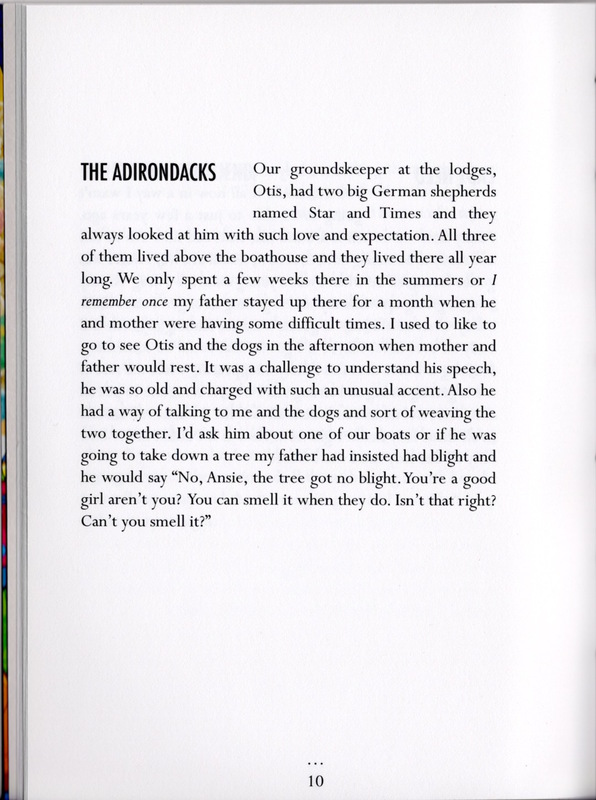 Small biographies and musing generalizations––men’s relations to each other and their lives. There is hope and loneliness, companionship and isolation and the simplest of filmic elements to contrast the complexity of human emotions.